A S. Province Of Spain, in An-dalusia, bordering on Cadiz, Seville, Cordova, Granada, and the Mediterranean; area, 2,822 sq. m.; pop. in 1870, 505,010. The surface is irregular, being traversed from N. E. to S. W. by ranges of the Sierra Nevada, forming most picturesque and fertile plateaux and valleys, watered by innumerable streams. The chief rivers are the Jenil, constituting part of the N. boundary, the Guadiaro, and the Guadaljoree, Guadalmedina, and Velez-Malaga. Lead, iron, tin, zinc, quicksilver, and manganese are found in large quantities. The climate is one of the hottest in Europe, but the great heat is temperedr by refreshing breezes from the southwest. The vegetation is everywhere luxuriant; the principal products are grapes of various kinds, especially those named muscatel and Jaere, the sugar cane, pineapples, chirrimoyas, and other delicious tropical fruits, aniseed, cumin, liquorice root, sumach, cork, and cochineal. The manufactures include silks, satins, cotton and hemp fabrics, morocco leather, wicker ware, hats, paper, soap, chemicals, and above all the far-famed Malaga wines. Agriculture and fishing are the chief industries in the interior and along the coast. The principal towns, besides the capital, are Velez-Malaga, Alora, Antequera, Colmenar, Honda, Marbclla, and Estepona. A City, capital of the province, on a gulf of the same name in the Mediterranean, 2G2 m. S. by W. of Madrid; pop. about 100,000, or with the suburbs, 130,000. 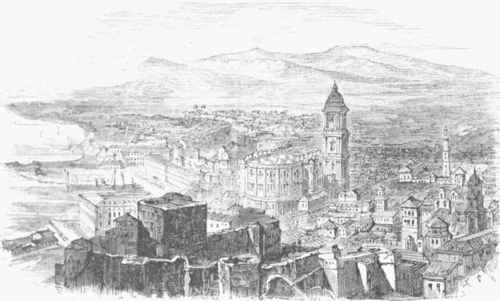 It stands in the Centre of a wide bay, surrounded by walls with nine Kates, and flanked by high mountains, on the base of which it rises in amphitheatre; and seen from the sea it presents, with the ruins of its ancient fortifications and its Moorish castle, the Gibralfaro, on a lofty eminence to the east, an aspect of much grandeur. The streets, nearly all extremely narrow, and many of them not admitting vehicles, give the town a peculiarly Moorish appearance. The Guadalmedina, crossed by two good bridges, traverses the city from N. K. to S. W.. dividing it into two quarters; but the river, which in winter becomes a formidable torrent inundating the streets is dry in hummer, when its bed serves as a thoroughfare. The houses (numbering about 7,000 in 1804) are large and high, and, being all white, look remarkably gay and clean. Most of them are built round a court. The Alameda, near the port, one of the most beautiful promenades in Spain, is surrounded by sumptuous edifices, and embellished with a number of fountains and statues, with rich marble seats at intervals through the grounds. In the Plaza del Kiego is a monument to the memory of Torrijos and his 49 confederates executed by order of Moreno on Dec. 11, 1831; and the Paseo de Reding is an agreeable resort. Chief among the public buildings is the cathedral, begun in 1538, and completed in 1719; it is a stately structure in the composite style, with a spire 300 ft. high, and magnificent decorations; the high altar and choir are noteworthy for the perfection of their carved works representing the twelve apostles and many saints. The episcopal palace and the custom house are handsome edifices. Among the other notable buildings are four parish churches and two chapels, eleven convents, ten nunneries, two foundling, one military, and three general hospitals, a prison, four barracks, the post office, and a superb aqueduct. The places of amusement are the theatre and the plaza de toros or bull ring, with a number of concert and dancing rooms. Pipes for the supply of water from the river Torremolinos, 6 in. distant, were laid in 1874. The port is one of the finest and most commodious on the Mediterranean, serving as a refuge for vessels compelled to leave Gibraltar during the prevalence of the S. W. winds. A mole to the east upward of 1,200 ft. long, with a lighthouse upon its outer extremity, offers good protection; and the harbor, which has good anchorage for about 500 ships, is defended by four forts. Among other fortifications is the Gibralfaro, a Moorish castle on the site of a Roman fortress, on a hill commanding the city. The principal articles of export are wines and raisins, including muscatel, the finest in the world, lejia or lye, and sun raisins. The crop of muscatel grapes yielded 2,700,000 boxes of raisins, the best of which go to England and Russia, and the lower grades to the United States. Sugar is extensively manufactured for export; the total production in 1872 was 21,960,000 lbs. The export trade in olive oil has greatly increased, mostly with France, Germany, England, and Russia; France and the United States take the most of the lead exported. The total value of the exports to the United States in the year ending Sept. 30,1873, was $2,814,682 79, raisins, lemons, and lead forming the principal part. The chief imports are linen, woollen, and silk fabrics, hardware, machinery, and cutlery. The port movements for the year ending June 30, 1873, were 1,028 steamers and 2,749 sailing vessels, with an aggregate of 542,802 tons. The chief manufactures are soap, cigars, hats, leather, white lead, and porcelain; and there are iron foun-deries, saw mills, lime and brick kilns, and silk-weaving establishments. The educational institutions are a seminary, a naval school, two endowed Latin, and a number of primary schools. - Malaga (anc. Malaca) was founded by the Phoenicians, and subsequently passed under the dominion of Carthage and of Rome. Its name is variously derived. Humboldt ascribes it to the Iberians; others connect it with niela'h, supposed to be the Phoenician name for salt fish, for the exportation of which the town was famous. In 714 it was seized without opposition by the Moors, who held it till 1487, when it was taken by Ferdinand the Catholic after a protracted siege. In 1810 Se-bastiani, the French general, took the city, and exacted a contribution of 12,000,000 reals. It was again taken by the French in 1823.